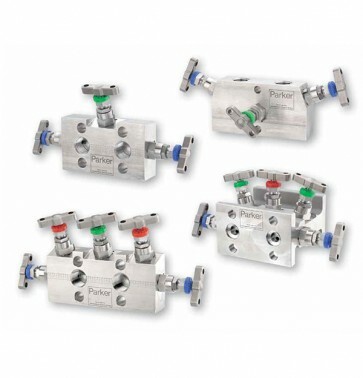 Parker's manifold valve offers superior performance with a comprehensive range of remote and direct mount manifolds to suit all types of instrumentation installations, specifications and applications. Parker's remote and direct mount manifolds are one of the most extensive in the process instrumentation industry and accommodates all types of instrumentation installations, specifications and applications. There is a choice of single-isolate-and-vent, double-isolate-and-vent, double-isolate-and-equalise, and double-isolate-equalise-and-double-vent block configurations. All needle valves in Parker’s H series manifold valves have PTFE seats and gland packing as standard, with PEEK seats and graphoil gland packing options. The needle valves use a standard globe style bonnet design for safe, reliable and repeatable performance. They feature an anti-blowout stem, a self centering, non-rotating spindle tip and an externally adjustable gland. As standard, the needle valves have metal-to-metal seats to ensure 100% bubble-tight shut-off, and PTFE gland packing. Graphoil gland packing and PEEK or PCTFE soft tips for gas applications are available. Further options include anti-tamper spindles, as well as lockable handwheels and T-bars. Most of the valves and manifolds in this series are manufactured from 316 stainless steel. Oxygen clean, NACE compliant and other types of materials are also available. As standard, the components have a maximum working pressure of 10000 PSI (689 bar). The operating temperature range depends on the type of valve seat and gland packing material that is specified.